September 28, 29, 30 – October 1 & 2, 1971. ” In that delightful Julian Slade musical Salad Days – our May production next year – the undergraduate lovers sing ‘We said we wouldn’t look back’. Which is alright for young lovers but I hope you will forgive an older lover – of drama – for reminiscing a little about the Amateur Theatre, [a derided phrase in some circles]. After all this is the first play in a new era for Wick Theatre Company. Hurrah for the new workshop and rehearsal l room. No more squatting on the waterfront in the odd corners of warehouses and marine stores. We are in occupation of our new premises with an enthusiastic team ready to present evermore interesting plays. Which leads me to this backward glance. We’ve mulled over, mauled and mashed up a few plays in our time. After all we did start as a Youth Group back in 1950. Ralph Dawes tells the story of an early play, was it Hogs Blood and Hellebore of 1951when the same chunk of dialogue was battered around three times before they were able to continue the scene. Then there was the play that finished twenty minutes early because a third act cue came up in the second act. Perhaps that was And This Was Odd, in 1952. The scenery they used in those days was made of canvas from the old Brighton Tram destination rolls. We still have a few flats of that type kicking around somewhere. We used to make all our scenery in the open at Penney’s Yard in Albion Street – an occupation for spartans on cold Sunday mornings amongst the coal dust. Our dear Molly Penney’s house in Church Lane was our HQ and she would no doubt agree that we’ve come a long way since those days. But we did have success when young. We won the Southwick Festival frequently, and I had a nostalgic glimpse of the past the other week when the Shoreham Herald turned out some photographs of Young Wick plays. Stripling Workmans, Dawes, Elliotts, Moultons, Hoppers and Bowens grappling with such plays as The Girl Who Couldn’t Quite , The Ghost Train , Blithe Spirit , Pink String and Sealing Wax , The Happiest Days of Your Life , and so on. It was fascinating and, of course, funny – other days, other clothes, how we change! The point is we have, I think, gone on improving with experience and training, particularly in the acting and production field. Do you agree? Well at least we’ve tried to keep up our standards and put on worthwhile plays. Admittedly our sets have suffered a little from our lack of workshops for several years but before that we had some memorable sets – Bess Blagden’s production of Captain Carvallo had a wonderfully atmospheric set, and A Touch of the Poet our 50th production had a beautiful set meticulously constructed. Now we have the place and resolve to give you memorable settings again. What an absorbing hobby drama is! When you’re in a play you think, talk and dream about it. You’re a member of a team, rehearsals are important, you can’t let the others down. Perhaps we do not have enough time to read plays and that is where you, the audience, can help. If you read or attend plays and you think there is something we ought to do, please tell us. We have a play reading and selection committee who do welcome your suggestions. You might even like to be represented on that committee. Enjoy yourselves tonight. More anon. This is Anne-Marie’s first part with Wick. She is French/Canadian and the trip from Quebec to Brooklyn should be a short haul for her. We welcome her to the company and hope she finds much enjoyment in this and future productions. We are certainly enjoying and benefiting from all she can teach us about western dialects. Valerie is no new comer either to Wick or this play. She played Catherine in earlier days – a little earlier – and is an Arthur Miller fan. Playing Beatrice is another ambition achieved. Valerie is no newcomer either to the WICK or this play. She played Catherine in earlier days – a little earlier – and is an Arthur Miller fan. Playing Beatrice is another ambition achieved. THE Wick Theatre Company’s choice of play to open their season – Arthur Miller’s A View from the Bridge – has certainly proved popular with two members of the cast. Their interest stems from a time many moons ago ” when they acted together in the play with another company in Enfield. But they will be playing different parts this time. Jack then played Eddie Carbonne, and now plays Alfieri, and Valerie, who then played Catherine, takes the part of Beatrice Carbonne. Other main characters are: Brian Moulton as Eddie Carbonne, Anne-Marie Sparks as Catherine, David Creedon as Marco and Ray Hopper as Rodolpho. The play is being produced by Wick secretary Jean Porter. The Wick, have incidentally, changed their box office procedure this season. Tickets for the play, which runs from November [sic] 28 until October 2, can now be reserved by phoning Shoreham 3641, and for the week preceding the play tickets will be on sale as Southern Organs in Southwick Square. When a young Italian – an illegal immigrant – seeks the love of Eddie Carbonne’s beloved niece, Eddie is doomed to an illogical and passionate jealousy, which carries him along inexorably, to his own death. All the elements of Greek tragedy, with a chorus to guide the audience along, are present in Wick Theatre Company’s compact production of A View From the Bridge, which opened on Tuesday night at Southwick Community Centre. Directed by Mrs. Jean Porter, the play is set in New York in 1953. Eddie, a blunt speaking longshoreman who works long hours unloading cargo boats, is disturbed to find that his young niece Catherine [Anne-Marie Sparkes] is taking a job and leaving school. His wife Beatrice [Valerie Bingham] sympathises with both the girl and Eddie, but believes it is better for Catherine to make up her own mind. However, when the two Italians, Marco and Rodolpho, who are Beatrice’s cousins, arrive to seek shelter while they look for work, the situation worsens. Eddie observes, to his disgust, that Catherine, the young girl he has worked hard for in 20 years on the docks, is developing a relationship with Rodolpho. “That sonovabitch punk just ain’t right,” he tells his bewildered wife. Eddie tries to find an ally for his suspicions about Rodolpho’s masculinity. He sneers at the young man’s fondness of clothes and music and his fancy ideas about night life in America. Eddie’s jealousy is borne to a new height when he realises that Catherine and Rodolpho intend to get married. He concludes that Rodolpho is merely using marriage as a means of securing American citizenship. Despite advice and reassurance from the family lawyer Alfieri [Jack Bingham], who acts s the chorus throughout, Eddie informs the immigration authorities of the two illegal entrants and they are arrested. Marco slurs his benefactor publicly and shortly before the young lovers’ marriage knifes Eddie in a street brawl. And so Eddie [played with superb depth by Brian Moulton] dies ignobly in his own neighbourhood, on the doorstep of his own home. As Jean Porter says, Eddie was vulnerable because he couldn’t understand the nature of his own love. He was doomed inexorably despite his own strength. Everyone in this two-hour play executed their parts with an impressive interpretation. David Creedon as Marco and Ray Hopper as Rodolpho managed to convey, in impeccable Italian tones, the right degree of Neapolitan mannerisms. Like Eddie, Marco obeys the law of love and trust, rather than man-made laws found in books. It is a moving often hilarious play. May of the mothers and fathers present on Tuesday night must have sympathised with Eddie. It is hard to release a fledgling once it has grown feathers. But the moral, as Alfieri desperately tried to point out, was there. What you can’t understand, leave well alone. THE WICK Theatre Group have a fine record but they surely surpassed themselves with their production of A View From the Bridge. It is not uninteresting to note that the play previously considered their best Anna Christie, featured the same leading actor, Brian Moulton. A View From the Bridge concerns illegal immigrants to America from Italy and the tragic effect on the head of their American cousins who take them in. Jack Bingham deals with complete competence with the rôle of Alfieri. a back-street lawyer who links the action. The immigrants arrive at the tenement dwelling of Eddie and Beatrice Carbone, played by Brian Moulton and Valerie Bingham. Brian Moulton gives a performance of towering quality, an ox of a man completely failing to understand his own mixed up emotions; Valerie Bingham’s Beatrice is a finely muted performance of great strength. Living with them is Eddie’s niece Catherine, whom he has brought up, played by Anne-Marie Sparkes. The immigrants are Marco and Rodolopho, brothers of contrasted character. David Creedon is the serious and saturnine Marco, impeccably correct in his attitudes and with an inherent nobility of spirit. His light-hearted brother is played by Ray Hopper. Between Catherine and Rodolpho dawns an innocent love and the acting of these two will be among your best theatrical experiences; it is tender, it is happy, it is real. Lesser parts are played by Neil Shephard, David Wiltshire, John Davidson, Michael Donkin, Alan Upton, Audrey Laye, Patrick Newman, Ann Baker, Susan Hollis, Angela Lovett, Jane Smith and Yvonne Coussins. The set design by George Porter and Barrie Bowen is a suitable complement to the acting. Above all is Jean Porter’s quite inspired direction; I challenge anyone to fault it in any degree. For years I have known Jean Porter as a good producer, but it took this production to show me just how good she can be. Arthur Miller is a brave choice of playwright for an amateur drama group. He expects a lot from both actors and audience. 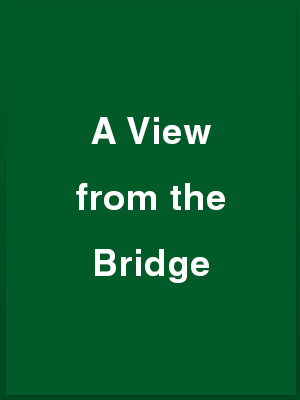 But if you feel up to a fairly dour theatre experience, go and see The View from A Bridge at the Barn Theatre, Southwick, because the Wick Theatre Company are fully equipped to meet the demands made on them. The play studies a New York couple, Eddie and Beatrice, whose niece, Catherine, wants to marry one of two immigrant cousins they are illegally harbouring. Her uncle’s possessiveness, however, intervenes, and because she refuses to back down, Eddie is drawn into a desperate and fatal act of betrayal. A competent cast do full justice to the seriousness of the dialogue and most of the extreme clashes of will, while taking good advantage of the humorous moments, too. Determination to be accurate about such things as accent, however, I felt hampered some of the cast from giving full rein to characterisation, and during the run they could all inject more energy into expressing individual traits. Brian Moulton, for example, who contributes a solid and moving Eddie, needs to differentiate more between the beginning and end of his rôle. A greater sense of exasperation is needed at the expense of the ponderous and deliberate side of the part, stress of which reduces the pace of the play too much [Webed’s note – some part of that sentence appears to have been lost!]. Ray Hopper, too, as Catherine’s fiancé, Rodolopho, could be less reflective and more effervescent. Valerie Bingham warmed to the part of Beatrice after a nervous start, while Anne-Marie Sparkes moved well in the vivacious rôle of Catherine. Jack Bingham has caught exactly the right tone of sad bewilderment as the lawyer and narrator. And David Creedon is visually powerful as the menacing immigrant Marco. Jean Porter’s direction is sensitive to the emotional highlights of the play, although she has occasionally let the small stage compress movement too much, so the production becomes too static. Lighting and set are excellent. That some members of the audience chuckled with surprise at one or two serious moments is a comment on them, not the players.